Dean Austin has told his Cobblers players that if they are not ‘prepared to fight for the badge’ on the shirt then they will not be part of his plans. 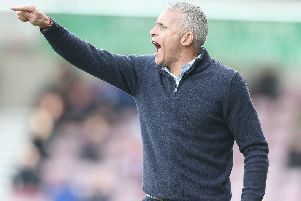 Town are preparing for Saturday’s crunch Sky Bet League Two basement clash with rock-bottom Notts County, and Austin is determined to do whatever it takes to stop the rot at the PTS Academy Stadium. The Cobblers are a lowly 20th in the table and have yet to win a game on home soil this season, but have a great chance to break their duck this weekend when they face a Magpies side that has failed to win a game this campaign - and has conceded an eye-watering 24 goals in their past seven league two encounters. Harry Kewell took over from the sacked Kevin Nolan earlier this month, and in his first two games has seen County lose 5-1 to Exeter and draw 3-3 with Stevenage, a match in which they led on three occasions. Austin sees Saturday’s showdown as ‘a good opportunity’ for him and his players to improve on what has been a dismal home record in recent times, with Town having won just once at Sixfields since January 20. And he has laid down the gauntlet to his players to prove they have the heart, courage, desire and ability to turn start winning matches and turn the club’s season around. “People have been reminding me enough that we have only won 14 games out of the past 71, so I am speaking about the mentality,” said Austin, who saw his team lose 2-0 at Port Vale last Saturday. “I believe in the group of players, and I believe that we are good enough, but what I am talking about now is resilience, desire to win, desire to keep the ball out of the net. “I felt privileged to be a professional footballer, and I worked every single day of my life as if my life depended on it. “I am honoured and privileged to be the manager of Northampton Town, but I have said to the boys that this is now bare-knuckle stuff. The team’s past two performances have irritated Austin, who up until a couple of weeks ago had been pleased with how the Cobblers had been playing, if not with their results. But the meek surrender of the 3-1 loss to Cheltenham Town last time out at home and last weekend’s reverse at Port Vale have hit a nerve, with his team having a knack of repeating the same old mistakes. “I don’t say too much after games,” said Austin. “I have been taught by some very good people that it’s sometimes best to keep your emotions in check after a match. “But they also said if you still feel the same way when you come back in on the Monday, then have your say.